A Healing Catalyst is the agent that makes the healing connection. The divine part of you is the healer. Are you a Healing Catalyst? The world is full of “healing catalysts” who facilitate healing – whether they do it primarily hands-on, with talk, through energy work, yoga, etc. 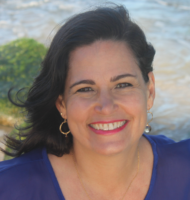 This website and my books describe how I catalyze healing with my clients and ways you can do it for yourself or with your clients. I want to expand the conversation about healing ourselves, each other, animals, plants and the planet. Join with me to build a Healing Catalyst Network to connect and share resources among those of us who are Highly Perceptive, dedicated, and in service. You may have heard of a Horse Whisperer, who uses skill and intuition to communicate with horses. Well, you could also call me a Body Whisperer – that is, someone who communicates intuitively with the human body. In my private sessions, I use a combination of techniques from bodywork (massage), psychotherapy, and shamanic journey. I intuitively hone in on the energetic knot that needs unraveling and release. Each session looks and feels different – even for the same person. All my sessions have in common: loving compassion, non-judgement, playfulness, curiosity, respect for your body and its emotions, and a fierceness about holding safe space that makes it easy for most people to trust me very quickly. Over the decades I’ve been doing bodywork, I found I say the same things to people over and over – things we have forgotten in our modern rush through life. We’ve learned to live in our heads, largely detached from our bodies and the information they give us about how to be wonderfully healthy. We go to doctors to ask questions about what’s ailing us yet the answers are already there, in our tissues, if we but remember how to hear them. My goal with my book is to help more people make those connections in their own bodies, heal, and feel better! 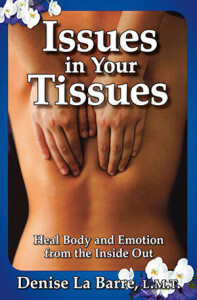 You can get many of the benefits of an intuitive bodywork session by reading Issues in Your Tissues. The tools I give you in the book work in conjunction with bodywork. You can also use them entirely on your own. You can return to it again and again as new layers of understanding reveal themselves. Plus, the book costs a fraction of what a massage would cost! Professional massage therapists will appreciate the candid recounting of sessions as a touchstone for their own work and as confirmation that we’re finally ready to discuss intuitive bodywork openly. Read my Passion Statement here.